Learn how to design your business according to your goals and resources. Our upcoming Mompreneur Meet up is a rare workshop based on the book, Business Model Generation by Alexander Osterwalder and Yves Pigneur. The speaker, Jackie Caniza, a success coach and co-owner of Business Hat Inc and a mompreneur herself, is a certified facilitator for this course. 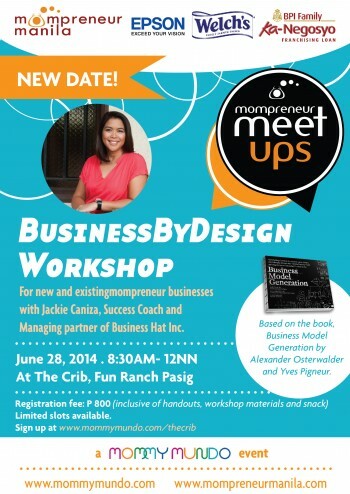 The workshop is scheduled for June 28, Saturday 8:30-12nn at The CRIB in Fun Ranch, Ortigas Ave.,Pasig City. Limited slots available. Workshop fee is P800 inclusive of handouts and snack but for active Mompreneur Manila mompreneurs and holders of the Mommy Mundo passport, registration fee is waived. Regiser now by texting 09176272425 or register online by clicking here. Thank you to our valued sponsors, BPI Ka-Negosyo, Epson and Welch’s for making this event possible.